Anyone else got some serious summer vibes? Here in our little corner of the world we’re looking at a week of 90+ degree weather, bluebird skies and lots of delicious rays of sun. I’ve got summer vibes and a serious case of beach-on-the-mind. Too bad I have to adult and go to this thing called “work” rather than stick my little toes-ies in sand all week. But hey, if I can’t go to the beach, I’mma bring the beach to me. And while we’re at it, I’mma throw in some magical mermaid vibes. ‘Cause I can. So whadda say we skip out on the drab office vibe and go full steam summer vibes ahead? To ensure that the mermaid tails are stiff enough to stand upright, you’ll want to make them at least one day ahead. Start by coloring your fondant with pink gel food coloring until you’ve reached the desired shade of pink. Knead in 1-2 tsp tylose powder (this will help the fondant harden completely). Work a small ball of fondant into the mold. You can use a sharp pairing knife to cut off any excess that sticks out over the edges of the mold. Gently turn the tails out onto a piece of parchment paper. Pour some gold powdered food coloring into a bowl and add a few drops of vodka or water until you have a paste. Using a small, food only paint brush, paint the ends of the tail gold. Set aside to dry. For the doughnuts, combine 1 tbsp granulated sugar with the warm milk and yeast in the bowl of a stand mixer. Allow to proof for 5-10 minutes or until frothy. Add the butter, egg and 3 cups of flour and beat on medium speed with a dough hook until the dough is smooth and elastic (about 3-5 minutes). The dough will be soft but shouldn’t be sticky. If it’s still sticky, you can add the remaining 1/2 cup of flour. Transfer the dough to a lightly greased bowl and allow to rise in a warm area until about double in size (30 minutes – 1 hour). 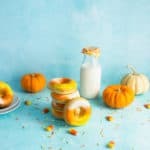 Roll the doughnut dough out to about 1/2″ thick and cut out 12 doughnuts using a doughnut cutter or round cookie cutters. Cover the doughnuts while the oil heats. In a large pot, heat at least 2″ of frying oil until it reaches 350F. Working in batches, use a slotted metal spoon or spatula to careful transfer your doughnuts to the oil. 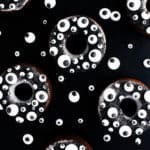 Fry the doughnuts until golden brown (30 seconds – 1 minute) and flip. Transfer the fried doughnuts to a cooling rack lined with paper towel. Once the doughnuts are cool enough to handle, roll them in the remaining 1/2 cup of granulated sugar. 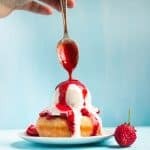 To make the glaze, whisk together your 2 1/2 cups powdered sugar, milk, and vanilla extract in a small saucepan over medium heat. Once the mixture becomes hot (but not boiling), remove the pan from the heat and whisk in the 2-3 tbsp. 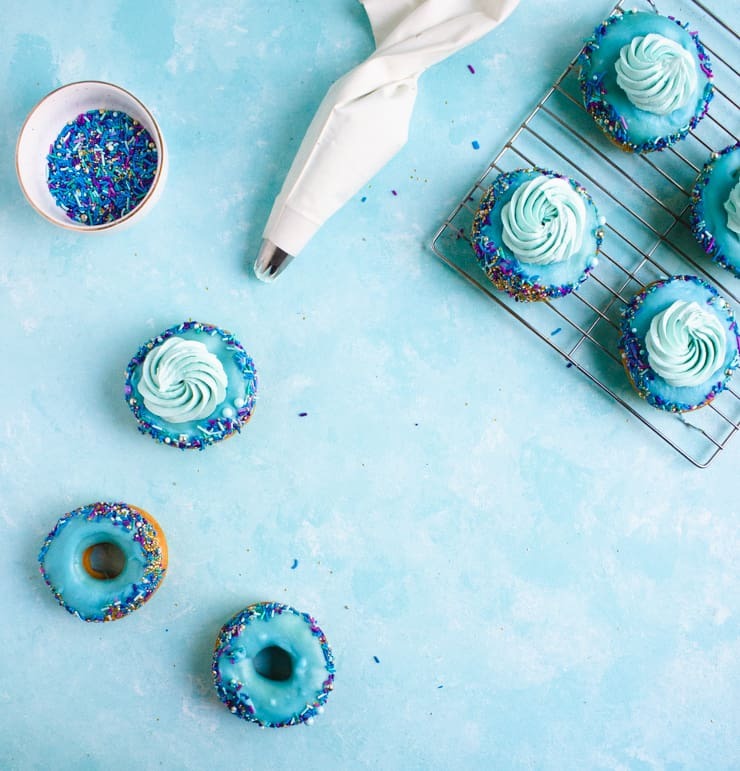 of extra powdered sugar to thicken up the glaze plus blue food coloring until you’ve reached the desired shade of blue. 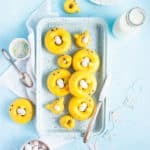 Dip each doughnut in the warm glaze, allowing any excess to drip off, and then immediately roll the sides in your sprinkles. To make the frosting, combine the water and sugar in a small saucepan. Bring to a boil and cook until the syrup is completely clear. While the syrup cooks, whip your egg whites in the bowl of a stand mixer until stiff peaks form. On high, pour the hot syrup down the side of the bowl and into the egg whites. Continue to whip on high until the mixture has cooled to room temperature (about 10 minutes). On low, begin adding small slices of the butter until all the butter has been added. Whip the frosting on high until it becomes a thick frosting (it’ll look curdled at first, but don’t worry. Just keep on whipping). Turn the mixer down to low and continue whipping until the frosting is completely smooth. Add turquoise food color until you’ve reached the desired shade. Spoon the buttercream frosting into a piping bag with a large star tip (I used Ateco 829) and pipe a little swirl of frosting over the hole of each doughnut. Gently press a mermaid tail into the frosting. In place of making the doughnuts yourself, you can use 12 store bought. Just make sure they’re not glazed, powdered or sugared. In place of making your own buttercream frosting, you can use a 16 oz container of store bought frosting. For powdered gold food coloring, I recommend Super Gold from Truly Mad Plastics. This isn’t a sponsored link, they just make the best powdered gold food coloring on the market in my opinion. If you’re looking for a mermaid tail mold, you can find a lot of options on Etsy. My mold is about 3.5 inches long. These are just adorable and I love the “splash” of color! 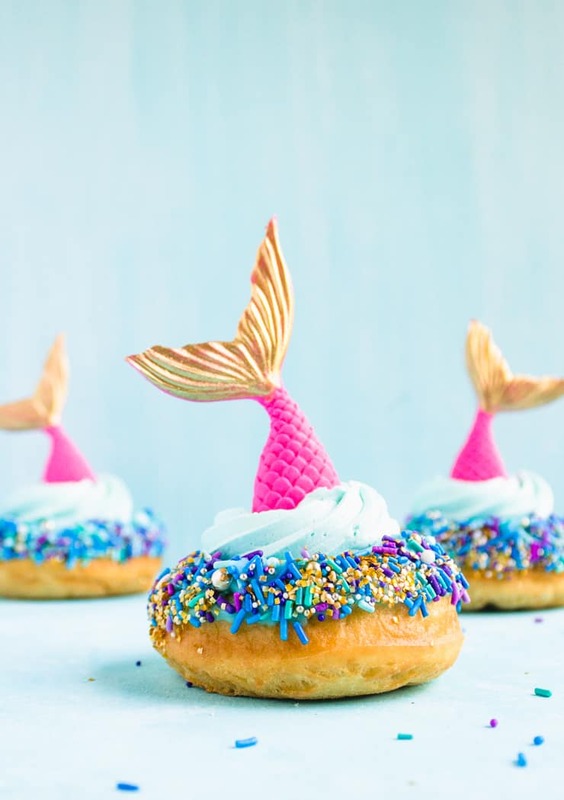 These mermaid doughnuts are perfect! 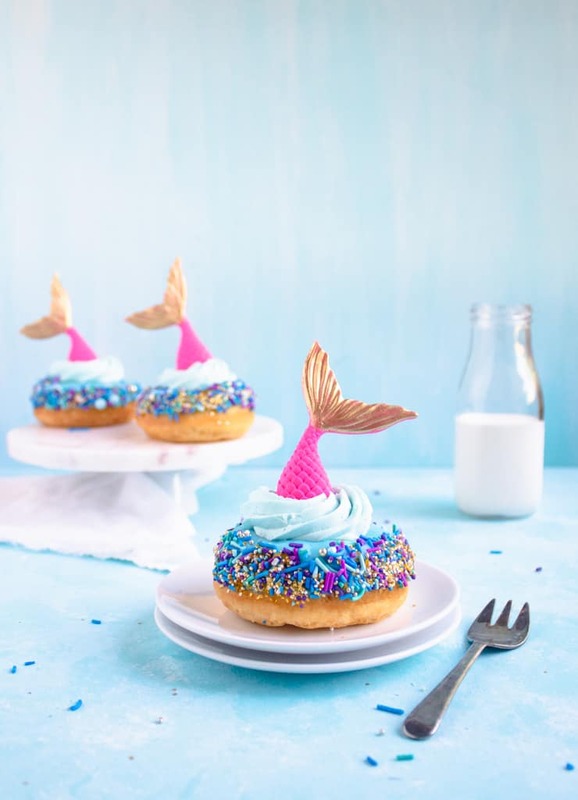 My great niece always pretends to be a mermaid and her birthday is coming up so I know what I’ll be bringing to her party! These are adorable! A friend of mine loves mermaid themed stuff and is planning a birthday for her toddler daughter. These would be perfect! How fun are these?! We just got back from a beach vacation, and these donuts are bringing me right back! Super cute, super creative! 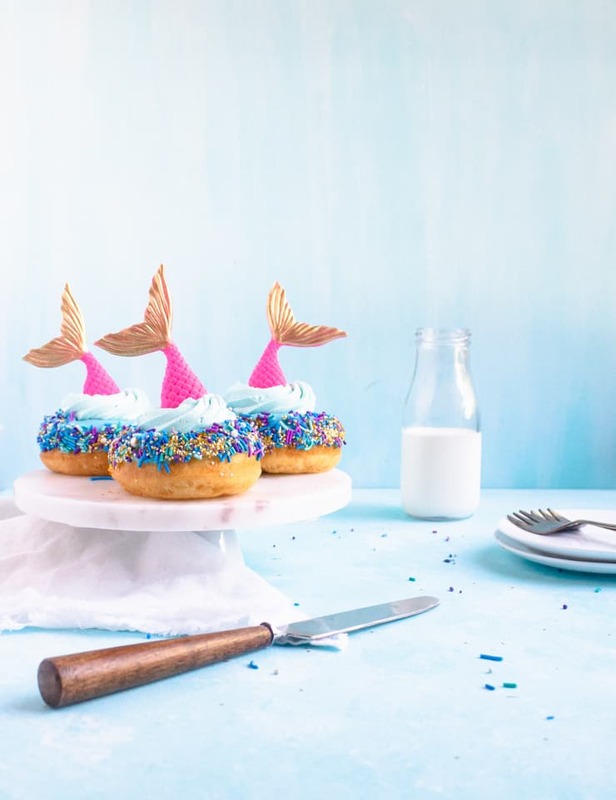 These are so cute and would be an awesome idea for a little girls birthday party! These are so much fun and look positively amazing. Where can you get the mermaid tail mold? Would it work with just chocolate or is fondant the best way to go? Hi Lauren! You can find the molds all over the internet in a wide range of sizes and prices, but I personally bought this one from Etsy: https://www.etsy.com/listing/510839669/mermaid-silicone-mold. You can totally do the tails in chocolate, but I’ve found chocolate to be a little harder to paint over with food coloring. If you’re not planning on adding additional colors to them, chocolate is a great option. My nieces birthday is coming up and she is just gonna die for these!! Can’t wait! Amazing creative idea. Mermaids are trendy now and i can see why! Look gorgeous! I totally didn’t expect that these tails were edible and hand-made until I read your recipe. That is seriously so impressive! These are gorgeous treats and I love the colors you chose. I am all about filling the hole of a donut with sweets, and topping it with something as adorable as this. I am just loving this! 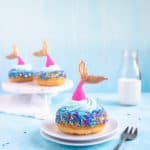 These mermaid doughnuts are too cute, they would bye perfect for my daughter’s birthday party! These are adorable! When I first saw the tails I thought maybe they were just a prop but nope, they’re fondant! So fun! These looks like such a fun ! Super cute 😀 Glaze looks absolutely perfect. I bet kids would be delighted when I serve them this at the party.